If someone asked you what a car ferry is, what would you say? 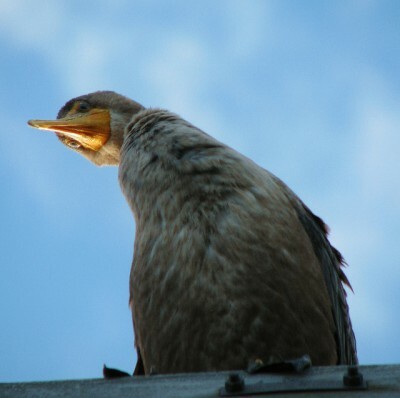 Have you ever seen one? I have to admit, I thought I knew, having grown up in Washington, where we have the largest ferry system in the United States, and the fourth largest in the world! But I learned something new… A car ferry is not, as you might assume, for automobiles, but rather it transported fully loaded train cars across the Great Lakes. After spending the first night of our mini road trip in Manistee, Michigan, we got on our way – our first stop was at the historic car ferry, the SS City of Milwaukee. This particular car ferry shuttled train cars from Muskegon, Michigan to Milwaukee, Wisconsin. It was built in 1931, and sailed until 1982 when she was permanently retired. She is listed as a National Historic Landmark. Still, she was quite impressive to see from the outside – with its 354 foot length and 56 foot width, she could carry between 30 and 32 loaded coal cars. She was steam operated, with two triple expansion steam engines, and is the last operational railroad car ferry on the lake. The ship is also used for haunted house tours in October (but only on the weekends and we were there on a weekday) and is currently being preserved. There is some talk of turning her into a bed and breakfast, but I don’t know how real that is. The website does say there is an overnight tour – but doesn’t offer any details. Our visit to the SS City of Milwaukee was a brief stop and we were on our way. 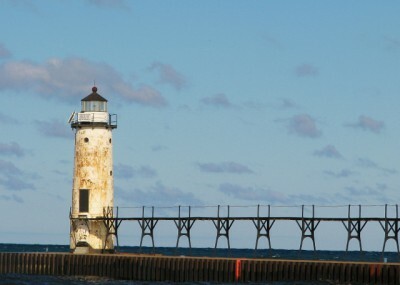 Next up – the Manistee Pierhead Light! The first light was built in 1870, but unfortunately, it promptly burned down in an 1871 fire that also destroyed much of Manistee. Coincidentally, that was the same day as the Great Fire of Chicago, and major fires in Peshtigo, Wisconsin, Holland, Michigan, and Port Huron, Michigan. The light was rebuilt and moved several times; the current tower was constructed in 1927 of cast iron. It is 39 feet tall with a fifth order Fresnel lens. 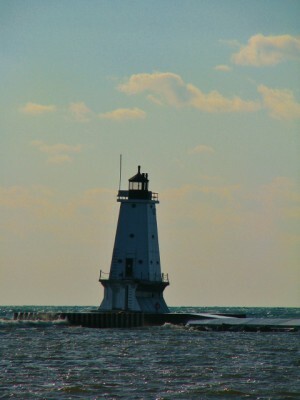 This light has a unique feature – an elevated catwalk on the pier makes it easier to walk from the mainland to the lighthouse in bad weather. It still looks rather precarious. 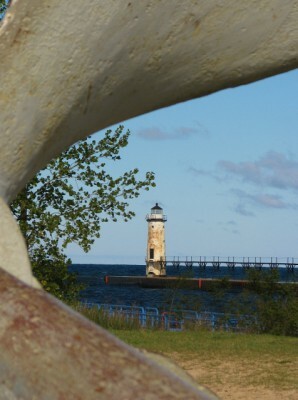 The Manistee Light through a ship’s propeller. While we were in Manistee, we walked along the river walk that runs right through downtown Manistee just behind the row of buildings on the main street. It was quaint, with benches for sitting and stairs to take you back up to the street. It would be the perfect place to sit with an ice cream cone in the summer and watch the boats go by. Even though it was cold when we were there, we got to watch a sailboat go through the two drawbridges! 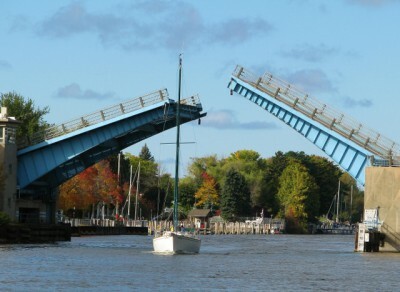 There’s is something about a drawbridge that gets me every time – I love the idea of the hustle and bustle of traffic stopping to let this little boat through. We also walked along the main street and took some photos of the historic downtown buildings. 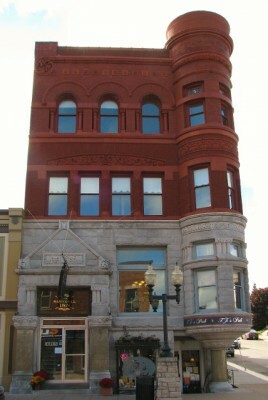 The entire downtown area is listed on the National Register of Historic Places! We found an outdoor clothing store that also happened to have a coffee shop. So we were able to get a warm up and a warm hat in the same place! 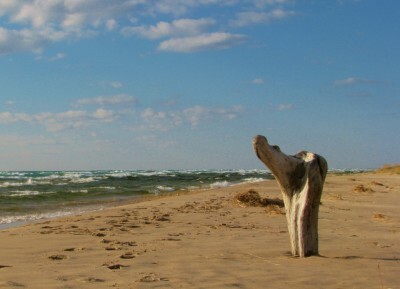 Have you been to Manistee, Michigan? What was your favorite part? What kind of houses does Michigan have more of than any other state? Lighthouses! 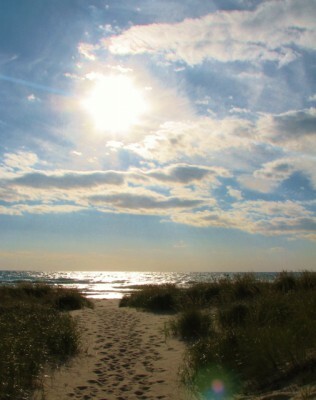 Michigan has more than 150 past and present lighthouses, and we were on our way to see one! After leaving Muskegon, we headed to Ludington, because there was a lighthouse I wanted to see there. We drove through a cute, touristy town – the lighthouse is dead ahead on the main road. The Ludington North Breakwater Light is not technically a lighthouse, because there was never a house attached to it, but I am going to call it one anyway. The Ludington North Breakwater Light is maintained by the Sable Point Lighthouse Keeper’s Association (I’m not sure if they require you to be a lighthouse keeper to join, but I hope not, because that might be a pretty small group…). It is open for tours between late May and Labor Day, but once again, we were shut down by the fact that it was the off season. The first light was constructed in 1871 with federal funds, but getting the funding for a light keeper’s house proved more difficult. Granted, one can just walk out the pier from the town of Ludington to the light, so that probably had something to do with it, but in bad weather the walk along the pier was very precarious. Even on a sunny day in October, the winds were high enough that we didn’t want to brave the walk along the pier, because waves were crashing over the concrete pier. Imagine trying to make the walk in the dead of winter, during a storm, with a wooden pier! It wasn’t until 1900 that a light keeper’s house was built. Eventually the wooden pier and the breakwater began to break down and a decision was made to construct the current concrete pier and a new light. The current pyramidal shaped light was constructed in 1924; the unique shape is to deflect the high winds and waves from the lake. It is made with steel plates, and is 57 feet tall. It was originally lit with a Fourth Order Fresnel lens (for more info on Fresnel lenses see this post), constructed in the United States rather than France, but the lens was removed several years after the light was automated in 1972. It is currently on display at the Historic White Pine Village, a tourist village that sounded interesting, but with the timing of our trip and other things we wanted to do, it just wasn’t in the cards for us. And just so you know, that tilt on the lighthouse isn’t my terrible camera angle. The lighthouse actually is tilted! In 1994, the crib that the light sits on settled and it tilted 4 degrees to the northeast. Repairs were considered, but abandoned due to the cost after it was determined that the lighthouse was still safe (don’t worry, I know you are going to scroll back up and look at the photo again – that’s perfectly fine). Next we drove down the road that runs near the water towards Silver Lake State Park. Before going into the park, we parked and were able to check out the lake and the sand dunes; Jon got his first look at Michigan sand dunes and loved them! But the weather that day was too cold and windy to enjoy the beach for long. Silver Lake State Park actually has a lighthouse too, but vacations are all about choices, and we decided not to visit this one – but I do wish we had the time for everything. 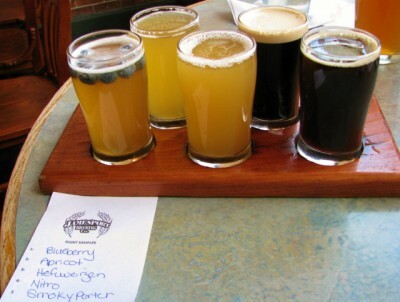 Blueberry Wheat – YUM! I loved this. A nice light wheat beer with just a hint of blueberry, and I loved that they served it with some fresh blueberries floating in it. Apricot Wheat – Very light; I didn’t like it when tried it alone, but liked it with food. Hefeweizen – This was a German style Hefeweizen (well yes, they are all German style, but you know what I mean right? Some brewers stick more to the traditional style). It wasn’t my favorite; despite usually being really fond of Hefeweizens. Nitro Stout – Creamy and smooth, with caramel and coffee. Yum! Smoky Porter – Lot of caramel and very smoky. I liked it, but probably wouldn’t want a whole pint. I ordered the Lake Perch, a specialty for this restaurant, and I don’t think I have ever had perch, so I wanted to try something new! It was lightly breaded and fried with homemade seasoned French fries. The side salad was delicious too. Jon had the IPA (he’s getting very predictable) with the Citrus Salmon; it was served on a bed of rice. He had a side salad too. We were both very happy with our choices. The downtown area of Ludington was quite cute, with several neat shops that I would have loved to poke around in. But they were closed when we finished with dinner (most were closed before we even started dinner). As it were, we continued on to our home for the night in Manistee. 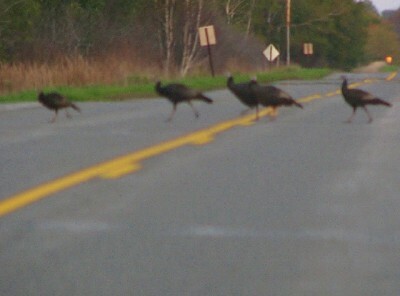 On a country road as the light was fading, we saw a flock of turkeys crossing the road. Turkeys! I had never seen wild turkeys before, so that was pretty neat, but the fading light (and the fact that Jon wouldn’t stop the car) meant that my pictures of them were blurry. As we were getting into Manistee, we were just seeing the last light of the day and enjoyed a lovely view of the lake. If you hold even a passing interest in World War II history, you have probably heard of the U.S.S. Indianapolis. If you have ever seen the 1975 blockbuster, Jaws, you have heard of the U.S.S. Indianapolis. But have you ever read the real story? Abandon Ship! The Saga of the U.S.S. 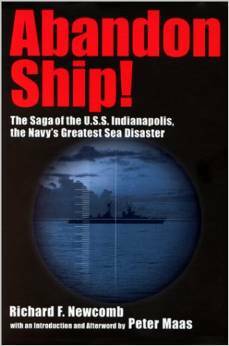 Indianapolis, the Navy’s Greatest Sea Disaster is the story of the U.S.S. Indianapolis, its secret cargo that ended the war, its sinking by a Japanese submarine, and the tragedy of its crew. Of the 1196 men who were on the ship, almost 900 survived the explosions from the torpedo and were forced to abandon ship only 12 minutes after the torpedo struck. Of those almost 900 men, only 321 were rescued four and a half days later. Ultimately, 317 men survived the ordeal. Over 500 men perished in the water, succumbing to injuries sustained in the explosions, exhaustion, drowning, or madness. Or shark attacks. There is no way to know how many died as a result of shark attacks, but the best estimates by the survivors are a couple hundred. Hundreds of men, left in the water for over four days – eaten by sharks. This book isn’t just about the shark attacks. In fact, it is much more than that. It documents the entire mission of the Indianapolis, from its departure in San Francisco with its precious secret cargo, to its brief stop in Hawaii, to its hurried trip across the Pacific to deliver its cargo to the island of Tinian. Then a brief stop in Guam, to replace some of the sailors on board. And then after Guam, a more leisurely trip to report to duty in Leyte. Except the Indianapolis never made it. Very few of the men on board knew that they were delivering the first atomic bomb, nicknamed Little Boy. Several days later Little Boy would be dropped on Hiroshima; only a few days after hundreds of men had been pulled from the water after spending four and a half days floating. The book details how the failures of multiple men and the lack of administrative protocols came together in a perfect storm. A storm where a missing ship carrying almost 1200 men was simply never missed. And how distress calls heard and documented in three different commands were dismissed without investigation. How if it weren’t for a single plane flying overhead, with a single man happening to notice an oil slick, these men might never have been saved. That man thought the oil slick might be an enemy submarine, so he opened the bomb bay doors to get a better look and drop a depth charge. And that’s when he noticed hundreds of tiny heads bobbing in the oil. They were so covered in goo that he couldn’t tell if they were American, or British, or Japanese. A call for rescue ships went out over the radio; at that time the Navy still didn’t know that these were the sailors from the Indianapolis. A seaplane was dispatched to drop survival supplies – however, upon seeing all of the men floating alone in the sea, with sharks nearby, Lt. R. Adrian Marks disobeyed orders and landed on the open ocean. His plane was damaged, but not enough to disable it; he taxied around and collected single men into the plane. Once the plane was full, he tied more survivors to the wings with parachute cord. Marks was not the only officer who disobeyed orders that day – en route he overflew the U.S.S. Cecil J. Doyle and alerted her commanding officer to his mission. Graham Claytor, Jr. went off route and began steaming towards the site. His was the first rescue ship to arrive. Although the Doyle was eventually dispatched to respond, the fact that Claytor set course several hours earlier for the site undoubtedly saved many lives. Sadly, Captain Charles B. McVay III, was court martialed and tried for his failure to zigzag while en route to Leyte. He was convicted despite the protests from most of his men, and the testimony of the commander of the Japanese submarine that sunk the Indianapolis, who had said that it wouldn’t have mattered. The Navy was looking for a scapegoat to divert attention from their own failures to notice the ship was missing, and they found one. McVay’s sentence was remitted and he served the rest of his career on desk duty, but the guilt from so many years of hate mail were too much. He committed suicide in 1968, dying with a small toy sailor in his hand. For over 50 years the story was largely buried by the Navy, until a 12 year old Florida boy watched Jaws, and got the idea for a school history project. Hunter Scott decided to place an ad in the Navy newspaper looking for Indianapolis survivors. A few responded to his ad, and he began interviewing them; in the end he interviewed 150 survivors. He learned of the injustice of the court martial and got the ball rolling to exonerate Captain McVay. Jon and I had dinner last night with my parents and my uncle who was up visiting from Oregon. The topic of wine came up (because really, doesn’t it always?) and my uncle mentioned that he is not a fan of wine. Too bitter. We got to chatting about very sweet wines, and I told him that there was a wine that tasted to me exactly like Martinelli’s sparkling cider. I must say, he sounded intrigued. It got me thinking that there are a couple of fruit wines that I have around the house and need to get to, since they aren’t going to last a long time. Once we got home, I hunted around for a few minutes and found the Mt. St. Helens Cellars Huckleberry Wine. Jon and I had stopped at this small winery on the way home from one of our many trips to Portland to see family. It is owned by a retired man and his wife, who decided to try their hand at a second career making wine in the shadow of Washington’s most active volcano. Gary makes some fruit wines and some grape wines, and we sampled several that day. I liked some of the grape wines, particularly their Albariño, but was very impressed with the fruit wines. They have something for everybody, whether you like a sweet wine or something more dry. Gary has a great sense of humor, giving his wines names like “The Volcano’s Last Syrah,” “Kick Ash Red” and “Sasquatch in a Bottle”. When you live near the site of the largest landslide ever recorded, I suppose you have to have a sense of humor about it! The Huckleberry wine certainly is sweet, but still has a nice balanced tartness that cuts through the sweetness. It is made from high altitude huckleberries from Mount St. Helens, which is impressive, considering that they aren’t very big, and you are competing with bears, coyotes and cougars for the berries – hopefully they aren’t looking for dinner during harvest! Let’s just say there aren’t that many cases of this wine produced. MI Road Trip: Landing Crafts and Pantyhose! Have you ever seen an LST? In particular – USS LST-393? What the heck is USS LST-393, you ask? Well, it is in Muskegon, Michigan, and we had the opportunity to see it after our visit to the Hackley and Hume Historic Site. 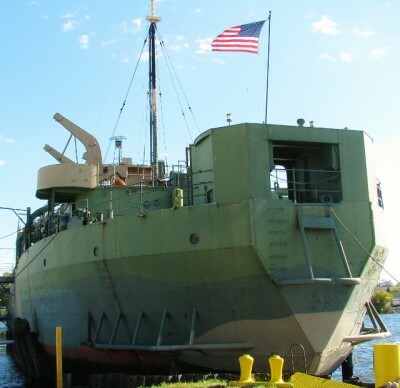 This is an LST-1 class landing ship, built during World War II to transport troops, vehicles and equipment. There were 1051 built during the War; this is one of only two to survive in its original configuration. USS LST-393 was critical to the following operations: the Sicilian occupation in July 1943, the Salerno landings in September 1943, and the one she is most famous for – the Normandy invasion in June 1944. She landed on Omaha Beach on the night of June 6, 1944 and offloaded several Sherman tanks and other materials, before spending another two days stuck on the beach due to the tides. The back of USS LST-393. In all, she made over 30 trips back and forth between Normandy Beach and England, supplying equipment and bringing back wounded soldiers and German POWs. After the European theater wound down, she was retrofitted for service in the Pacific Theater, she was on her way to the Panama Canal for a trip to Japan when the Japanese surrendered. 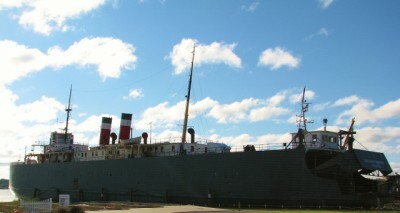 USS LST-393 in Muskegon, Michigan. Sorry about the quality of the photo; there was a fence so I couldn’t get a better angle. These are the doors where the equipment was unloaded onto the beach. After her wartime service, she was purchased by the Sand Products Corporation and began life as a merchant ship, transporting new cars from Muskegon to Milwaukee. 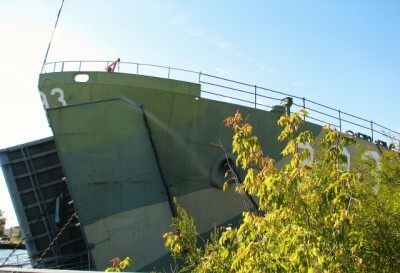 Since 2000, a couple of volunteer groups have been trying to restore her; she has been cleaned and painted and is open for tours during the summer. As she was closed for the season when we visited, we took some pictures and marveled at her enormous size – 328 feet in length and 50 feet wide, carrying a crew of about 140 men. While driving around Muskegon, we also saw a gigantic, empty building that piqued our interest; it had a giant sign that said Amazon on top. I was sure it wasn’t the current Amazon retailer, but what was it? As it turns out, the Amazon Hosiery Company moved from Indiana to Muskegon in 1895. Amazon produced cotton underwear, gloves, hosiery, hooked rugs and army shirts. At its peak, it employed over 1,000 people – mostly women. Unfortunately, materials rationing during World War II spelled the end for the Amazon Hosiery Company. After the war, several businesses occupied the space, and then it sat vacant for about a decade, until it was converted to apartments beginning in the 1990s. The project was completed in 2001. It is a beautiful building from the outside; it would be neat to see what they did with the apartments! After our lunch at Founder’s Brewery, we got back on the road and made our way to Muskegon, Michigan. 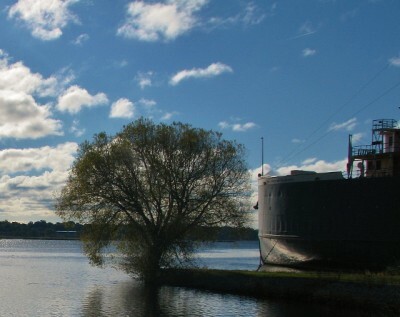 It is a small lakefront city established during Michigan’s lumber boom, and kept vibrant due to its location on the lake and shipping routes. We wanted to tour the Hackley and Hume Historic Site, which consists of two historic homes that are owned and operated by the Lakeshore Museum Center. Charles H. Hackley is Michigan’s most famous lumber baron (as if each state has a most famous lumber baron!) and Thomas Hume was one of his business partners. When we showed up to tour the homes, we were pleasantly surprised to learn that the tour was free in October! They charge a nominal fee all season long, but the home is also partially funded by property taxes, so October is the time the museum gives back to the community in the form of free admission. Hackley purchased the double lot in 1887 and promptly sold part of it to Hume. The homes and the City Barn behind the homes were designed and built between 1887 and 1889. Despite having been designed by the same architect and largely using the same color scheme on the exterior of both homes, they are very different from each other. Hackley was married and had two older adopted children; he was the founding partner of the business and had his home built as an extravagant retirement home. 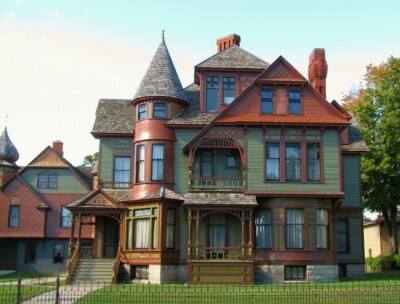 The Hackley home was built to impress; it was very detailed and intricate. Both homes are built in the Queen Anne Victorian style, but the Hackley home features elaborate woodcarving throughout, majolica tile, leaded glass windows, imported marble and expensive furniture. 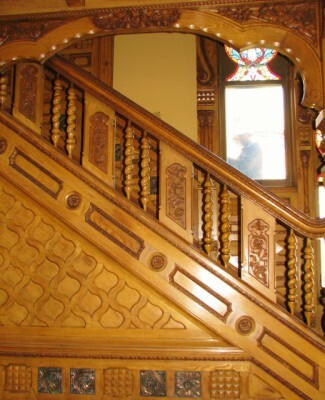 The stairway in the Hackley House – No that’s not a ghost outside the window; its the painter. 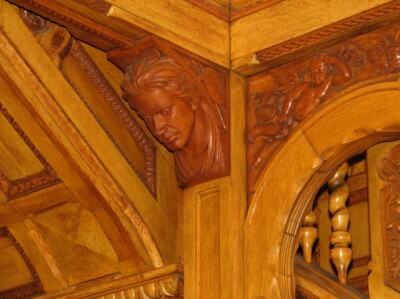 The entryway of the Hackley House has five carved heads, representing the five races of man. This one is the Native American. 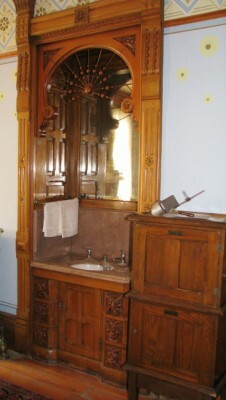 The beautiful woodworking around the sink in the bedroom. The bathroom was also very unique – apparently Hackley was a bit of a germo-phobe, so he had the bathroom completely tiled to ensure that it was sanitary – even the ceiling! The bathroom also had an old time toilet paper holder. The toilet paper came in squares back then, not rolls, and the squares were held down by a spring-loaded metal bar. 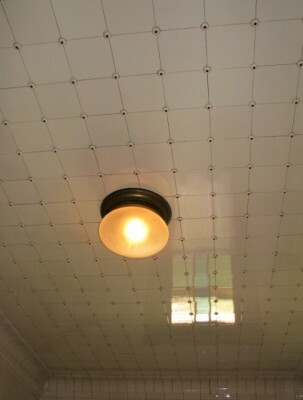 Have you ever seen tile on the bathroom ceiling? 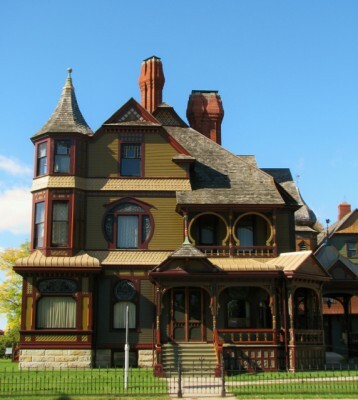 The Hackley home largely remained true to the turn of the century period. Hackley’s daughter lived in the home for a period of time after her father’s death, then eventually sold it to the American Red Cross, who took good care of the place. The Hume house had a more open floor plan, and was more modern, but also more modest. The Hume family had 6 or 7 children, and he was a lesser partner in the business, so he didn’t have as much money. As a result, his home was nowhere near as richly appointed. 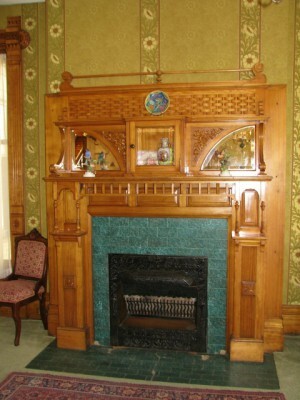 It is presented as it existed later in life after being redecorated in the 1920s. It is still clearly a rich man’s home, but the décor in the home is much more simple. Both homes are great examples of Queen Anne style architecture, and it is interesting to note the differences. The two homes also share a gigantic carriage house; with each half of the carriage house a mirror image of the other. Now it houses a small museum, a theater for the movie of the area and family history, and a gift shop. The museum is small, but it explained more of the history of the area, and has an incredible amount of detail about the Hackley and Hume families and even the servants who lived in the homes and carriage house. Part of the barn has been restored to its look as a stable and the coachman’s quarters. Photos are allowed inside, without flash, and just in case you are wondering, yes, the homes are painted in their original colors. The Hume house has… 14… exterior colors! The Hume House (with the City Barn in the background) – larger much less intricate than the Hackley House. And 14 exterior colors! 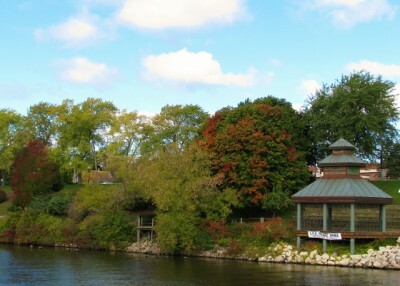 The Lakeshore Museum Center also operates two other historic properties that are open to the public, a replica of a fire barn built in 1875 (and largely funded by Charles H. Hackley) and the Scolnik house, a historic home decorated to explore the lives of working class families in the Depression era. We didn’t have time to visit these other properties, but I would love to go back and check these out as well! I came home yesterday after a long day at work to find a full glass of this – the Foris Vineyards 2010 Pinot Noir. Jon had wanted a Pinot, and this one fit the bill. Jon and I visited Foris in August, and enjoyed the great wine and laid back atmosphere of the tasting room. It is a deep strawberry red – a truly beautiful color. On the nose, it is fairly mellow, with scents of ripe sweet cherries and sun-warmed blackberries. On the palate – it was delicious. It is a nice medium-bodied Pinot, with predominantly cherry flavors but enough earth and spice to make it really interesting. If you have tried this wine, I hope you will let me know what you thought! Cheers – it’s almost the weekend!